Tonight is Burns Night, the celebration of the birthday of Scotland’s favourite poet, Robert Burns. 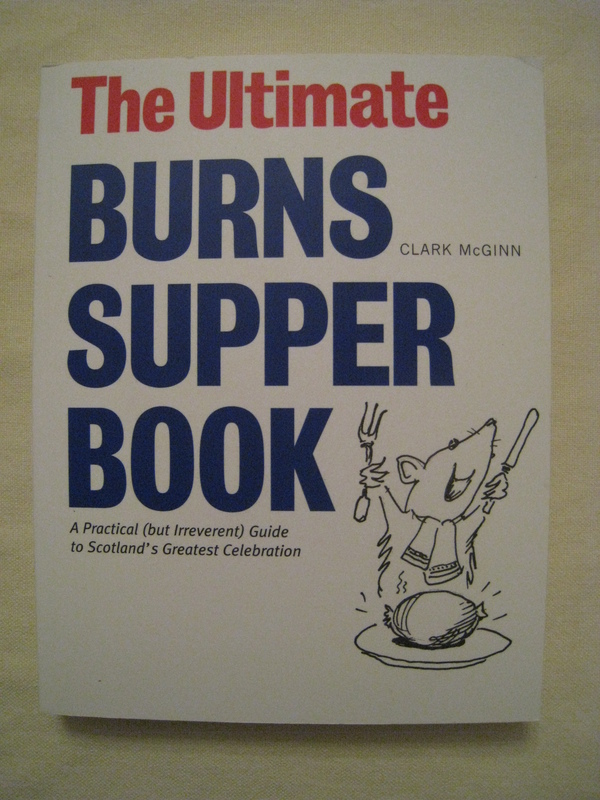 (To learn more about Burns Night, see my previous post, here.) To prepare us for this important event, Qype arranged a wonderful evening for Qypers, at Salt Bar in London’s Marble Arch. There, we were to taste three single malt whiskies, courtesy of Talisker, one of the proud single malt whisky labels owned by drinks giant, Diageo. Needless to say, what with escaping the demands of work and dealing with slow public transport, I was late. I missed the piper who piped beautiful Scottish sounds into this Edgware Road bar. I missed the Address to a Haggis, with sharpened dirk ready to slice into the swollen ball that is a haggis. I missed the smoked salmon blinis that accompanied the Talisker 10 Year Old. But that was all. In true Epicurienne style, and knowing already a thing or two about Burns Night, I caught up quickly once I arrived. As I entered the ground floor space at Salt Bar I noticed that it was filled with a great many pairs of eyes fixed on a man called Colin. Ah, my fellow Qypers. What a gluttonous bunch we are. Mention food, whisky, cocktails or something else worthy of placing in one’s mouth and you have our full attention. I knew I was in the right place. Jo from Grayling sped the second whisky of three across to me as I tentatively encroached on the otherwise full bar. You see, Colin was in full swing. Our whisky coach for the evening, he was expounding on the virtues of Talisker. Right now we were sipping on drams of Talisker Distiller’s Edition – a delightful mouthful of deep sm0kiness. Colin told us that it had tones of Muscatel, dates and stewed fruits. All I could taste was a whisky-imbued smokehouse. As I like smoked fish, smoked cheese, smoked ham – this was a very good way to start the evening for this particular latecomer, but I obviously need to work on my whisky palate. As my fellow Qypers tucked into beautifully-presented rounds of haggis layered with neeps and tatties, I headed once more for Grayling P.R.’s Jo Seymour-Taylor. “I was late, I know. I’m sorry about that. But do you think I could try the first Talisker? Just so that I can compare.” I asked. Jo was charm personified, whizzing off to the bar to find me a dram of the whisky I’d missed. 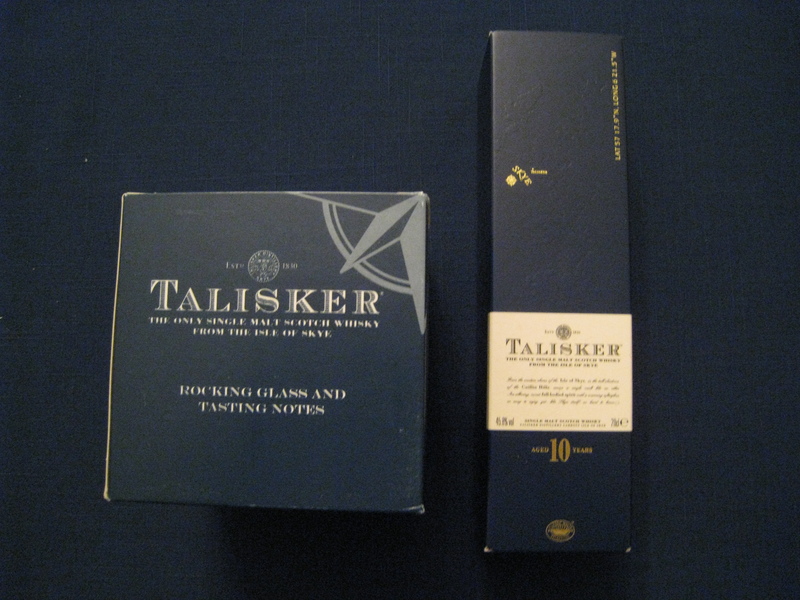 When she returned, I sipped on the Talisker Ten Year Old, and sighed. “It’s very good, a bit salty, still smoky…” I told her, “but the Distiller’s Edition has spoilt me. I enjoyed it so much that this now doesn’t seem half as wonderful as it would without comparison.” Impractical though it may be, I’ve always had expensive tastes. 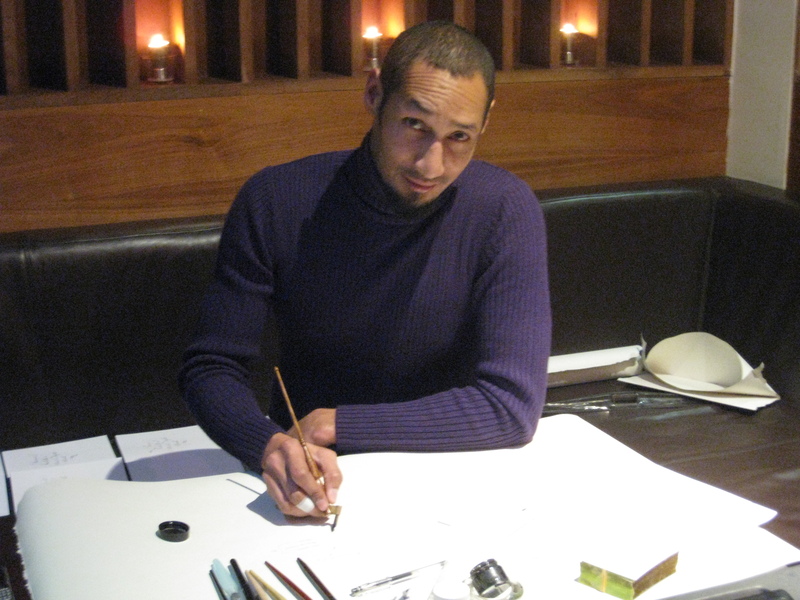 Jo smiled at my honesty, turning to introduce me to a surprise – the calligrapher named Paul. There he sat, patient with pen and ink as he inscribed hardback notebook after notebook for every guest. “What’s your name?” he asked, and so I told him, and a few minutes later, my notebook lay amongst the others left to dry. What a superb touch, I thought. To invite people who like to write to an event and then to give them something in which to write! That’s what I call consideration of your audience. 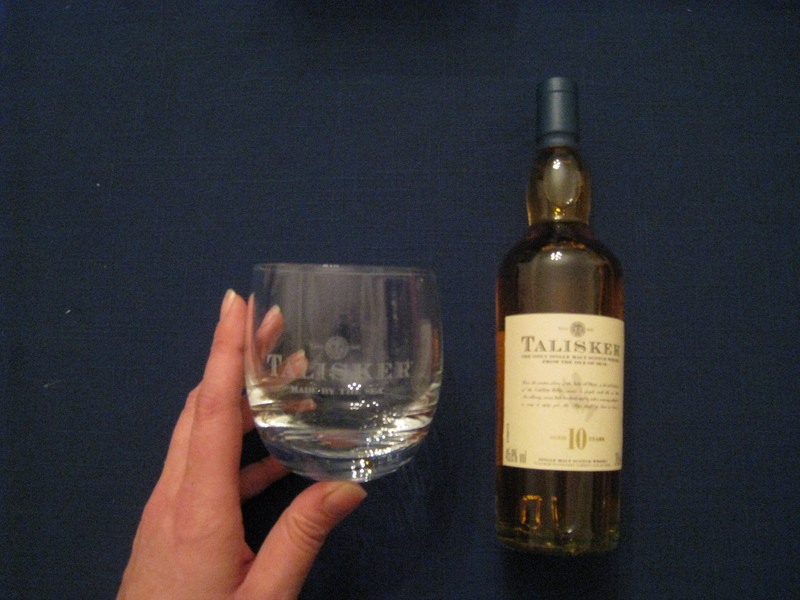 I held my glass of the third and final Talisker for the evening – Talisker 57 degrees North, named for the location of the distillery and also its alcohol content (ouch), and followed Colin’s instructions. I placed my hand over the glass and swilled it in circles. Lifting my hand I sniffed and oh my sainted trousers, what an aroma there was now, thanks to all that swilling releasing fumes enough to entice a pack of single-malt – loving hounds from across the nearest three neighbourhoods. “Now sip, but do not swallow.” Colin was a firm tasting master. “Move the whisky around your mouth for fourteen seconds.” We counted. Obviously my counting was done in my head, lest I spurt good single malt across my new friends. “When you get close to fourteen, the flavours will explode in your mouth,” Colin told me. And so they did. It was veritably difficult to hold it in without becoming a human fountain of whisky, but the increase in flavours was worth the heat now pervading my mouth. “I taste everything like this,” Colin admitted, “Whisky, wine, spirits. This is how you find the true taste of a drink.” Well, I’m a convert. That Talisker 57 Degrees North was something else. It wasn’t exactly sweet, nor was it as robust as the first Talisker of the evening, nor as smoky as the second. Yet there remained hints of smokiness with a touch of peat and citrus. Ah, the citrus was what paired it so well with the final solids of the evening: chocolate mousse, elegantly served in flutes. Colin was not done with me yet, though. “Pour a little of the whisky onto the mousse,” he suggested, and I did so obediently. The next mouthful of smooth chocolate had a heady enhancement of whisky. And why not? My mother makes fabulous chocolate mousse laced with Cointreau. 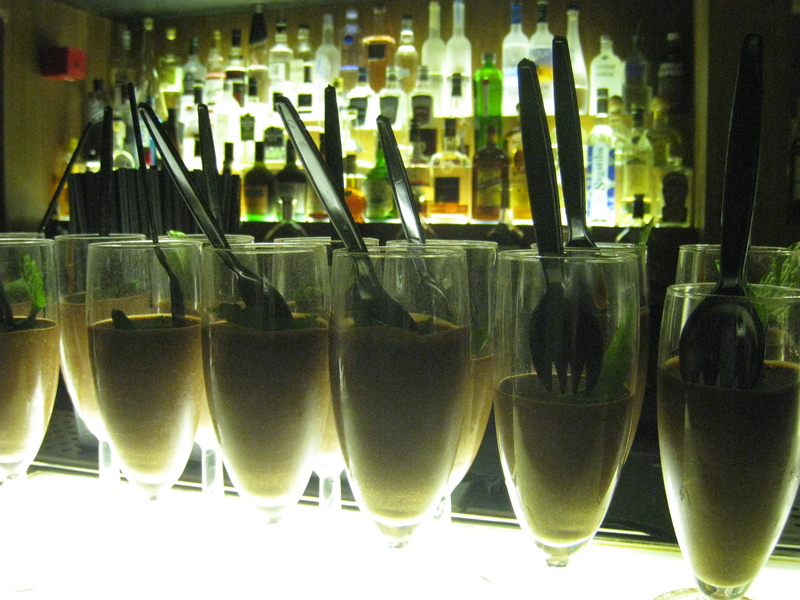 Single malt fabulosity drizzled on chocolate mousse was not something I’d tried before, yet it tasted oh so very right. Thank you, Colin. I’m now hooked on chocolate mousse with whisky. How’s that for a new vice? 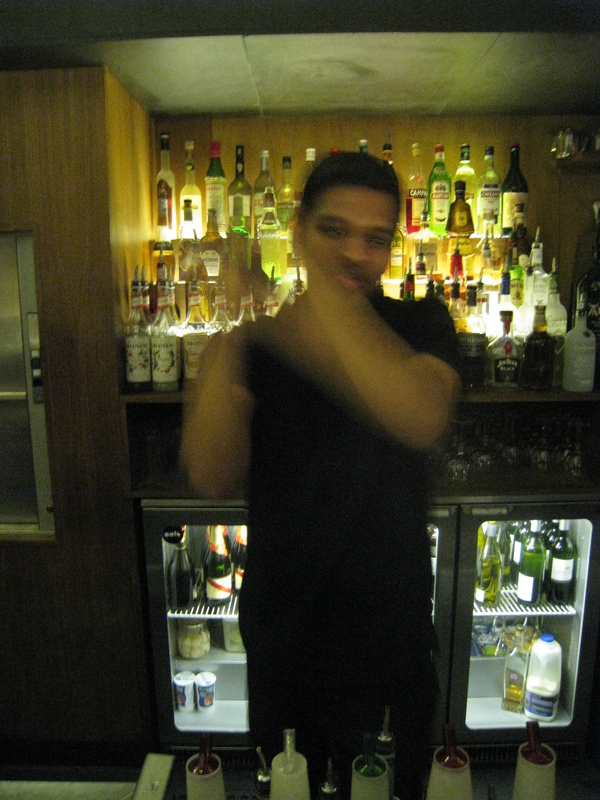 The next person with whom I chatted was the manager of Salt Bar, an amiable chap called Vansi Putta. 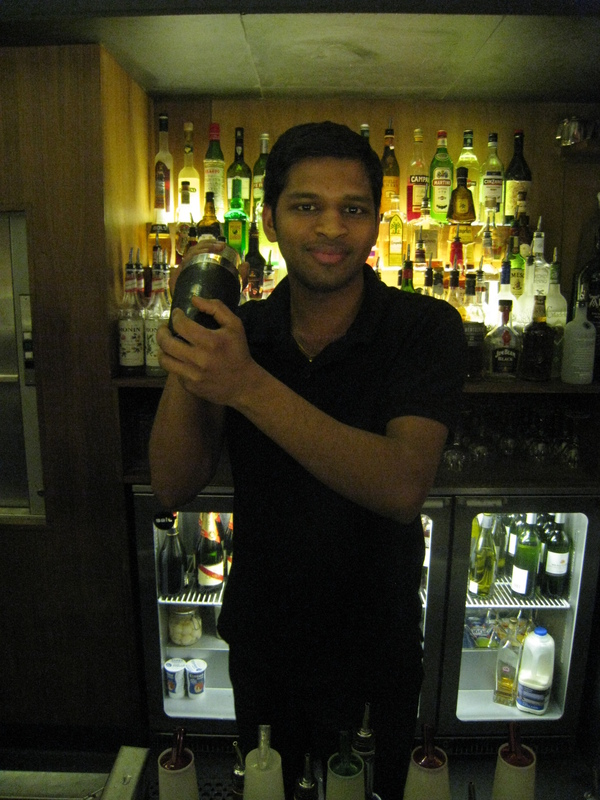 We marvelled together at the display of whisky bottles around the bar. Some names were familiar: Glenmorangie, Glenfiddich, Laphroaig, Cragganmore and Dalwhinnie. Others, made me smile with their funny Scottish names, especially Knockando!! 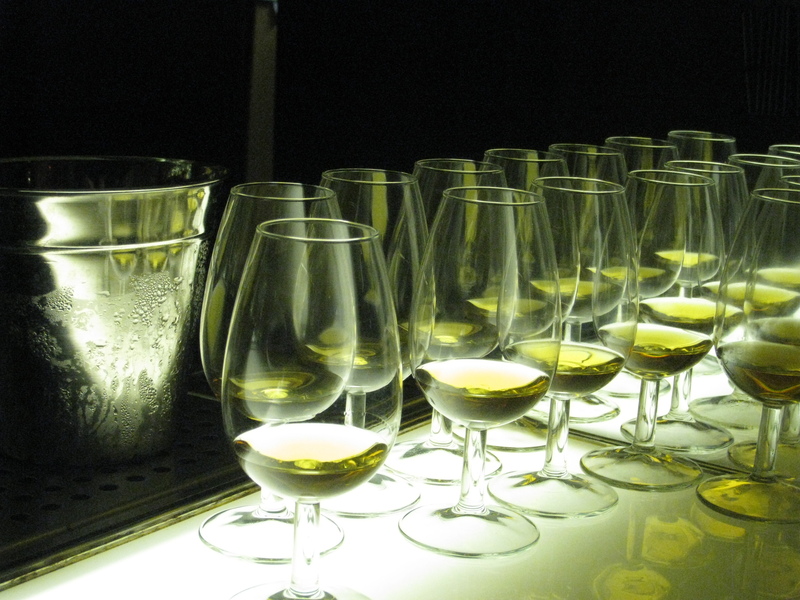 Vansi explained that Salt Bar has a whisky specialism, and they even provide Whisky Tours. For instance, for £25.00 you can go from the Highlands (Clynelish 14 yrs) to the Lowlands (Auchentoshan 10 yrs) to Campbelltown (Springbank 10 yrs) and Islay (Caol Ila 12 yrs) via none other than Speyside (Macallan 10 yrs fine oak). If you want to go international, you can try Glenfiddich Solaro Reserve from Scotland, Bushmills 3 Wood 16 years from Ireland, Suntory Yamazaki 18 years from Japan, Monkey Shoulder vatted malt and a good ol’ Jack Daniel’s Single Barrel from the States. That will set you back a cool £35.00 a head, but oh, what a journey. Add ingredients to Boston Glass, shake and strain into highball glass filled with ice. Top with ginger ale. My, if I’d enjoyed the Talisker drams of earlier, this was a very pleasant surprise. I’d just been telling Colin how my parents have always recommended taking single malt neat, to get the true flavour. But here was a cocktail made with a single malt and it was refreshing enough to drink in summer. So perhaps from now on I won’t view whisky as a drink for the snow days. So, with at least fifty per cent of me coming from The Land of Wee Kilties, tonight I’ll have me a wee haggis, a wee tumbler filled wi’ a wee dram o’ Talisker, and a few mouthfuls of neeps and tatties. But in the interests of keeping my waistline, I might pass on the choccy mousse and save it for special occasions. Thank you to Qype, Talisker, Diageo, Grayling, Salt Bar, Clark, Colin, Paul the Calligrapher and the Piper Who Was Not Afraid To Bare His Knees In The Cold Night Air. Happy Burns Night to you ALL!!! Next Post Vietnam – Tell me what YOU want to know. Sounds like a great night and I’m envious. I’d love to met up with someone who REALLY knows their whiskey. Whiskey is an acquired taste but once you’ve developed a taste for it, you’ll always only sip it neat and unpolluted. Razz – you’d love the expert we had the other night then. My parents are single malt afficionados so I know a little bit but after meeting Colin Dunn I realised how little that little bit is! Great post! It’s as if I was there! Really? Chris, my dear, you WERE there! Thank you so much for all your hard work with arranging this. You’re a clever, clever boy! Count me in for whatever you plan next! Oh yeah! Ha ha ha. It was great to see you. Hope to catch up soon.